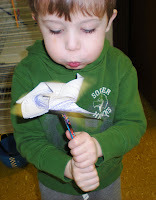 Our discussions today centered on the weather phenomenon, wind. Like so many things, we had a great time with this. I started by going over the lion/lamb theory and then asking what type of weather might be like a lion. From there we went into wind. 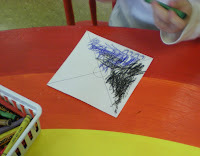 We talked about seeing wind, hearing wind, feeling wind. 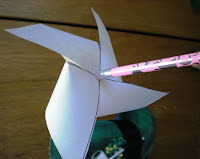 Could we make wind? (Not break wind!:). 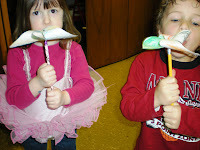 I then had a bag of items I brought from home and we made wind with our mouths to see if they were items that would move with the wind. This was really fun. 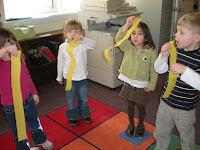 We finished by me passing out a strip of crepe paper and we blew them around the room. 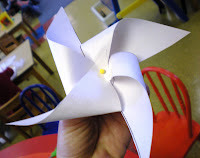 We also took a look at the book called, "When the Wind Blows," by Amy and Richard Hutchings, photos by Richard Hutchings, to see some different things wind could blew. 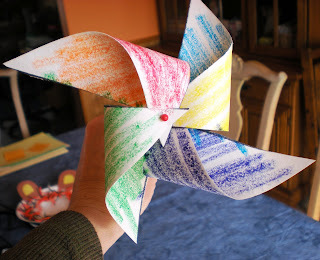 Our craft today was a pinwheel. This is always a class favorite. I cut out all the squares and mark them with a big X on each side. 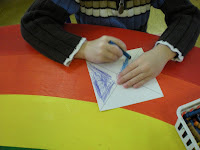 At the center of one X I trace a nickle to make a circle. The next step is to cut on the lines, but not go inside the circle. I stress this very much when showing them at circle time. I also don't let them do this part themselves unless I know they are really proficient with cutting. 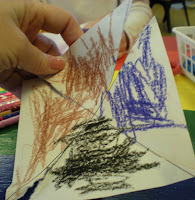 I hold the square, they use the scissors, and we say--"Cut, Cut, Stop." The last step is mine to do. Take every other corner and bend it toward the center of the square. 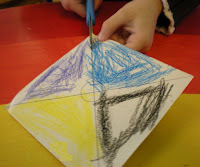 When they are all gathered together, take a straight pin and push it through all 4 corner pieces. Then continue pushing the pin through the center of the X. Finally take an unsharpened pencil and push the pin into the eraser. Give a good blow and around it goes. 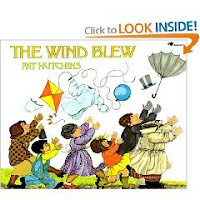 The book I read today is called, "The Wind Blew," by Pat Hutchins. This is a funny story of the wind coming around and taking lots of items and tossing them for a while. 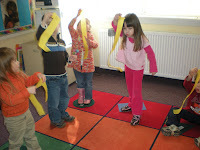 We use this story for counting, "How many items has the wind taken now?" 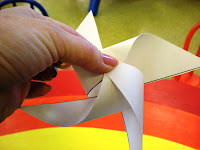 We also use it for predictions as each page has the next item the wind will take and I ask the children what they think the wind will get next. We also read it just because it's fun. We ended our day playing with the parachute. What better way to have fun with wind.